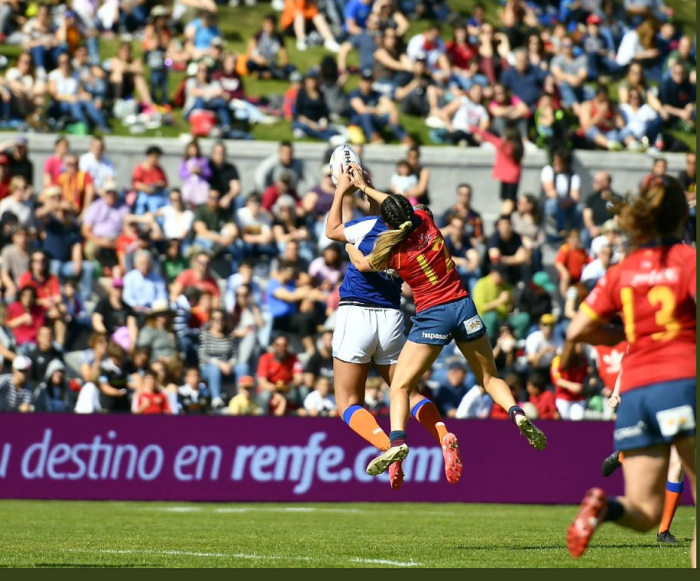 A crowd of near 9000 – comfortably a record for women’s rugby in Spain – watched their team retain their European Championship title in great style in Madrid on Saturday. After an even opening 10 minutes, the greater experience of the Spanish – and especially Patricia Garcia gave the home team the first score. Awarded a penalty a few metres from the Spanish line, Garcia spotted that the Dutch defence had switched off for a second and charged through for an easy score. The Dutch had marginally more of the ball to that point, turning over the Spanish repeatedly, but had not managed to turn that into territory, the sevens experience of many of the players by some good handling and passing, and willingness to run with the ball on a perfect day in Madrid and an excellent crowd. But the effect of that early score was to reduce the nerves of the Spanish team, who now took cotrol and should have scored a second try a few minutes later but for a mistimed final pass with the line beckoning. Pressure continued with Spain now retaining possession far better, working their way down to the Dutch line, and on 19 minutes Anna Puig ended a long period of Spanish pressure to crash through the Dutch defence from a short Garcia pass. 14-0. A good period of Dutch pressure followed, but they again failed to turn it into points before Spain were able to relieve the pressure. A long period of Spanish possession again moved them into a strong position. A yellow card for Dutch fullback Willemijn Ter-Avest for a reckless challenge at a ruck, which also caused Anna Puig to leave the field with a shoulder injury, gave the Spanish a perfect base. From a scrum, flanker Olivia Fresneda broke away but just failed to make the line. Paula Medin is on hand to finish. 19-0, after 32 minutes – and the score was unchanged at half time. Still a player up, a fourth Spanish try followed soon after the restart, a classic team effort ended by captain Paula Medin. 26-0, after 46 minutes. 16 Isabel Rico; 17 Isabel Macias; 18 Maika Brust; 19 Monica Castelo; 20 Olivia Calvo; 21 Carla Rodriguez; 22 Eva Aguirre; 23 Paula Requena. 19 Eline Koelman; 17 Nicky Dix; 16 Robin Wubben; 6 Annemieke Van-Vliet; 20 Esra Van-Ramele; 22 Miriam Van-Der-Veen; 21 Marsha Volker; 23 Hiske Blom.